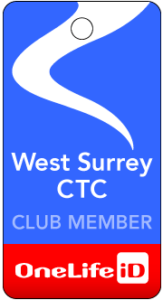 Our club (West Surrey CTC) holds limited personal information about our members, in order to communicate with and between members, to organise cycling events, and for safety reasons. With the implementation of the General Data Protection Regulations (GDPR), this information will only be held with members’ explicit “Opt-In” consent, and for the effective operation of the club, the welfare of our members and compliance with CTC insurance guidelines. You will give your consent by Opting In and by providing your details to us. You are entitled to see, and if necessary correct or request deletion of the information held about you, upon request to the Secretary. You may also withdraw your consent for us to hold information about you, however this will impact our ability to communicate with you and may undermine your safety on our rides. Contact information for those who have given their consent is used selectively (for example it is provided to ride leaders and the coordinators of WhatsApp Groups). A small amount of additional information such as attendance at rides is available only to committee members. Your personal information is not distributed by WSCTC to third party organisations and every effort is taken to protect your information. To the best of our ability, contact information will be deleted after two years if you are no longer an active member of WSCTC. However, for example, it may be impractical to delete all copies of this information if it is held in archive data bases. Shared copies of some information (including contact information) is held on web-based ‘Cloud’ services such as Google Drive and Dropbox with access only available to selected authorised people. This web-based information may be held on servers outside the EU or UK.